Starbucks, the world’s favourite American coffee house, is now open at the Orchard Centre - one of the first arrivals as part of the centre's big expansion. Starbucks is the place to relax with friends or take a break from shopping. Enjoy high-quality whole-bean coffees, fresh, rich-brewed, Italian-style espresso beverages and a variety of pastries and confections. Starbucks also sells coffee related accessories and equipment. 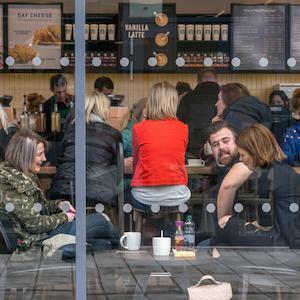 Customers relax and chat in the new Starbucks cafe.